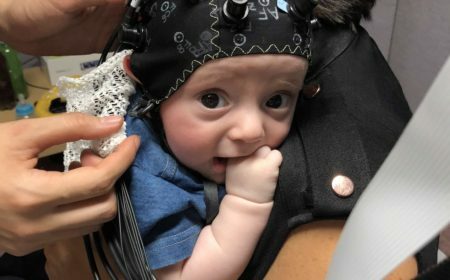 Infant wearing a brain imaging cap that uses light to measure activity in the hearing and language areas of the brain. With infants as young as 2 months old receiving hearing instruments, a clinically efficient and effective method to evaluate the efficacy of the hearing instrument is needed, so that early optimisation of the device choice, gain parameters and signal processing can be achieved. In this way, language development with life-long social implications will be individually optimised. The work at the Bionics Institute in our newly established BABilab (Behavioural and Brain Imaging Laboratory) has already shown that functional near-infrared spectroscopy (fNIRS) is effective in showing brain activation in adults to speech and other sounds. This project will develop clinical fNIRS tools to evaluate and optimise hearing instrument fittings for infants and young children, so that every child can receive the optimal management for early language development and lifelong quality of life.